Few things can be more frustrating than a chronic case of acne. For decades, people have been studying the science of acne in order to formulate more effective and less irritating remedies for all skin types. Some of the more popular prescription treatments contain a class of chemicals called retinoids which work by preventing dead cells from blocking pores. 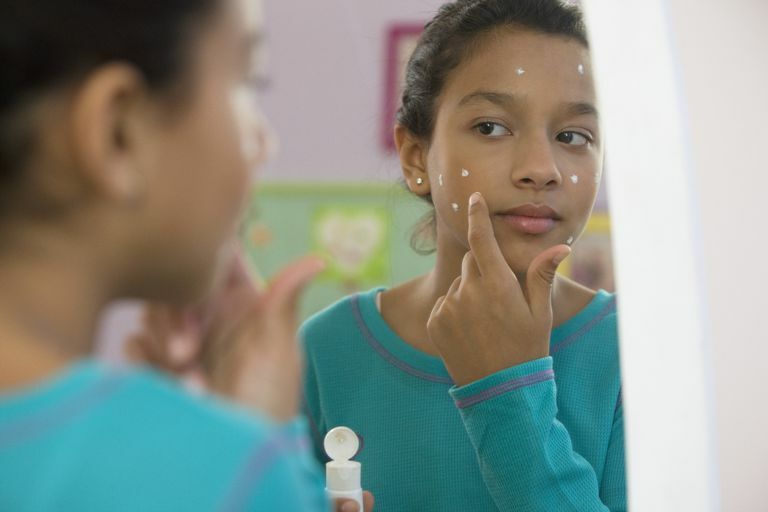 Acne is caused by the effects of hormones on the pilosebaceous unit, a structure in the skin which consists of a hair follicle, sebaceous gland, and a hair. When the follicle becomes blocked, it causes both the accumulation of oils (called sebum) and the overgrowth of an otherwise normal bacteria called Propionibacterium acnes. This overgrowth causes damage to the lining of the follicle and allows the infection to set in. The immune system responds by sending white blood cells to the site of infection to kill the bacteria. This causes the formation of a pus-filled pimple. While the follicle will gradually heal itself, repeated or extensive outbreaks can result in visibly inflamed, red skin, and deep scarring. There are a number of different approaches to treating acne. Some products contain benzoyl peroxide or salicylic acid which aim to clear blocked pores. The more severe cases often incorporate oral or topical antibiotics (like minocycline) alongside these pore cleansers. Retinoid medications work slightly differently. These topical creams and gels are derivatives of Vitamin A and are considered the treatment of choice for comedonal acne (blackheads and whiteheads). They work by promoting the production of new skin cells to effectively push oils and dead skin out of blocked pores. By doing so, they also prevent the formation of new blackheads and whiteheads. Retinoids are considered a very strong treatment and must always be prescribed by a doctor. There is an increasing variety of remedies that incorporate the use one of three retinoid drugs: tretinoin, adapalene, and tazarotene. Tretinoin is a third-generation retinoid medication and one of the better-known products on pharmacy shelves. They are marketed under the names Retin-A, Avita, and Renova but are also available as a generic. The product is available as a cream (0.025%, 0.05%, 0.1%), a gel (0.01%, 0.025%), and a liquid (0.05%). Creams are less potent than gels, while gels are less potent than the liquid. Tretinoin breaks down when mixed with benzoyl peroxide so they cannot be applied at the same time. Side effects include skin irritation so precautions must be taken when starting. Use of tretinoin also increases the risk of sunburn. Of the currently available brands, Retin-A Micro 0.1% is a slow-release option which is far less irritating to the skin. Adapalene is a newer product used to treat mild to moderate acne and is marketed under the name Differin. Adapalene is available as a gel or cream at 0.1% and 0.3% strength. It is stable when used with benzoyl peroxide so they can be applied at the same time. It is milder on the skin than the other retinoid products. It is known to have both exfoliation and anti-inflammatory properties. It is considered equally effective compared to tretinoin. Tazarotene is also a third-generation retinoid marketed under the names Tazorac, Avag, Zorac, and Fabior. Tazarotene is available as a gel in 0.05% and 0.1% strengths. It can be more irritating to the skin than the other retinoids (although symptoms tend to resolve themselves within the first two to four weeks of use). While rare, there have been incidences of worsening acne in some. People who have experienced skin irritation should be especially careful to avoid excessive sun exposure.